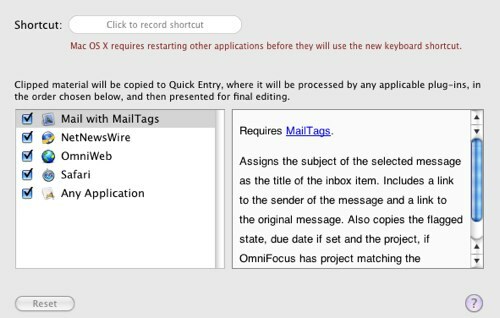 Once lightly configured, via the OF Preferences, Clippings allow you to select text and images from inside most OS X applications and send it to the OF QuickEntry box, where it gets munged into an inbox task automagically. My favorite way to use this right now is inside Mail.app and alongside Scott Morrison's wonderful MailTags plugin. Let's say I get a message from my client, Thorstenson Finlandson, containing some bit of work that he wants me to do. See how I selected some of the text? Now I select "[Mail] > Services > OmniFocus: Send to Inbox" (n.b. : you can also define a system-wide key command for this in OF Preferences). And, waa-lah, the selection gets sent to my OF QuickEntry box. Note that the message Subject is the default name of the task, the selection is added as a "Note," and (this is huge) the sender's email address is added as a link, as well as an URL that points me back to the original message (thanks for that one, MailTags!). 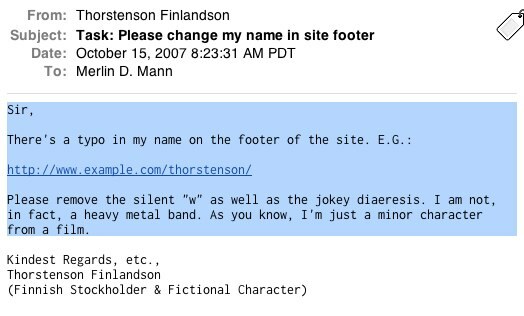 Since Thorstenson thoughtfully used an awesome subject line, I'll need only a bit of light editing and the addition of a few task details to turn this into a real thing. All that note stuff I added is safely shunted away in its currently-hidden field, but I can bring it up any time by selecting the task row and hitting "CMD-[apostrophe]" or by clicking the "Expand Note" icon on the far right. Happily, this works right out of the box in many other popular OS X apps (I'll go out on a limb and guess that it works in most Cocoa apps that play nice with OS X Services; feel free to correct me). But this already feels like a really healthy, Quicksilver-like habit to me. I love a) that it's super-fast, and b) that I keep that wonderful link back to the item the task came from. Disco. Could I do things like this inside a Single Heavyweight Application? Yes, probably. But, personally, that's not my gig. I love Mail.app for email, Safari for web browsing, NetNewsWire for feed reading, and so on. I've chosen a series of super-sharp paring knives over one monstrous Swiss Army Knife, because, frankly, that's just how Daddy rolls. I love how Clippings capitalizes on standard OS X technologies to lightly glue things together for me, regardless of my app preference. Personally, I don't need a massive robot to try and do a bunch of thinking for me; I just need a few very simple tools that shorten my path from cognition to completion. Anyhow, as you can see, I'm a little giddy about this and wanted to share it with you guys. If you're in on the sneaky peak, be sure to give Clippings a spin (along with the hugely useful Perspectives). If I may say, my OmniGroup friends are doing a swell job on what feels to me like a very solid and non-fiddly app. A little bird tells me that a certain fast-talking new OmniGroup employee with hip glasses and a buzz cut may soon have a new OmniFocus screencast for you. Watch this space later this week for details. So when is the app going "live"
Submitted by berchman on October 15, 2007 - 11:52am. I've used kinkless and now iGTD, and have been waiting for the final stable release of OmniFocus for what seems like forever. I do want to give it a try but cannot trust my data to beta releases. I believe Omni's website says fall release. Here we are in the fall. Anyone know when OmniFocus is going to go v1.0?